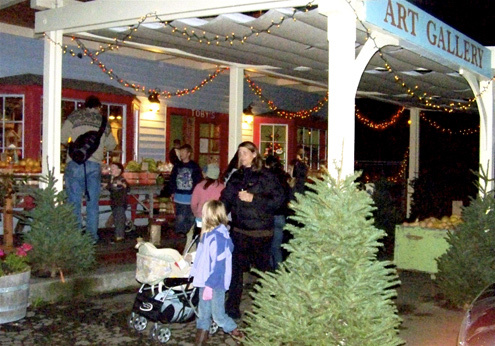 Friday’s Path of Lights in Point Reyes Station gave a festive start to the yuletide. 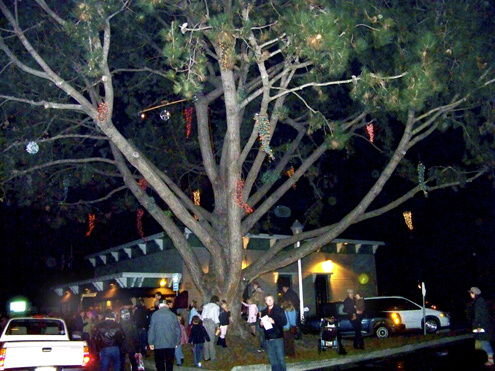 Hundreds of West Marin residents flocked downtown after dark for events in several locations. The annual lighting of the town Christmas tree, which is between Wells Fargo Bank and the Palace Market, drew a crowd that sang Christmas carols and held up candles. 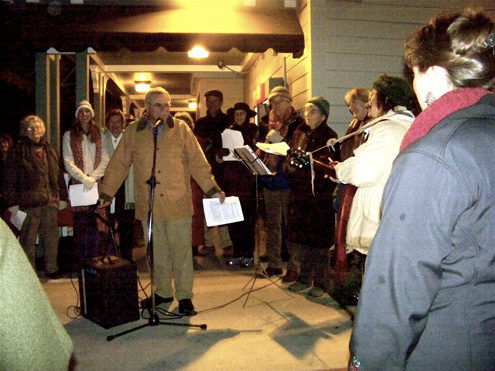 West Marin Senior Services organized the tree lighting. The group’s chairman, Chuck Gompertz of Nicasio, welcomed the crowd, who sang along with Harmony Grisman and other West Marin musicians. 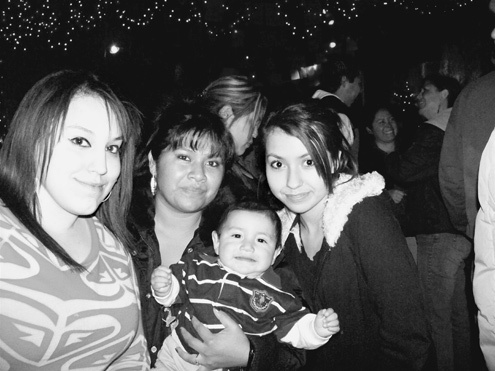 Part of the crowd (from left): Jasmine, Maria, Carina, with eight-month-old Giovanni. 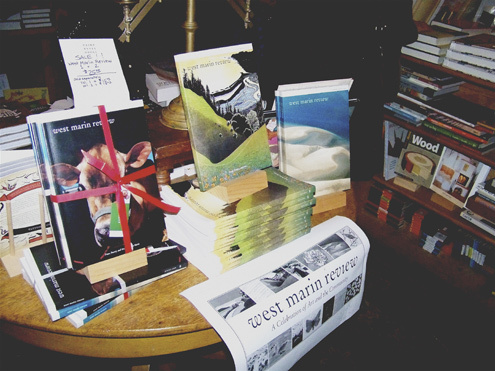 Across the street, Point Reyes Books celebrated the release of The West Marin Review, Volume 3, a fascinating compendium of art, stories, essays, and poetry. The contributors range from Nicasio School 8th grader Kevin Alvarado, whose painting warns of violence against cattle rustlers, to native Alaskan Jan Harper Haines, who writes about belief in the supernatural. In Hootlani!, Jan describes her Athabascan village’s fear of referring to dead people by name. 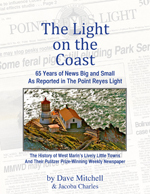 Point Reyes Books and the Tomales Bay Library Association co-published The Review. 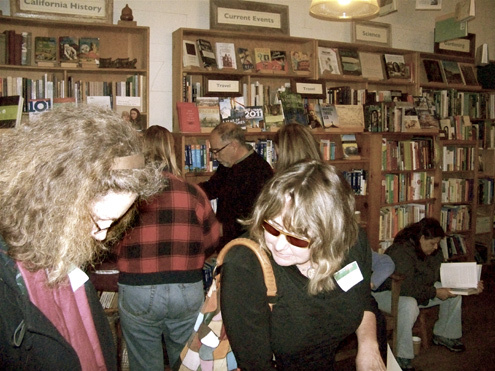 Here Steve Costa (center), who owns the bookstore with his wife Kate, ladles out hot, spiced cider while contributor Amanda Tomlin (left) signs a copy. Having contributed Tall Tales of Intelligent Animals to The Review, I was asked to take part in the book signing. I did, but many of those on hand were more interested in my new electronic cigarette. E-cigarettes, which provide users with a minuscule hit of nicotine, have no tobacco and emit only water vapor. Because there’s no smoke, I was allowed to enjoy mine inside the bookstore. One oddity of the e-cigarette is that the recharger for its battery, which powers the vaporization, does not plug into a wall socket but into the USB port of a computer. Meanwhile down the street, the gallery at Toby’s Feed Barn opened a show of art by Celine Underwood, carvings by Ido Yoshimoto, and prints by his father Rick Yoshimoto, as well as photographer Art Rogers’ portraits of the artists. 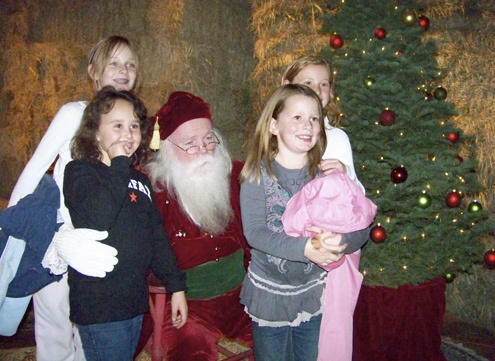 Santa Claus showed up among Toby’s hay bales to hear children’s Christmas wishes. 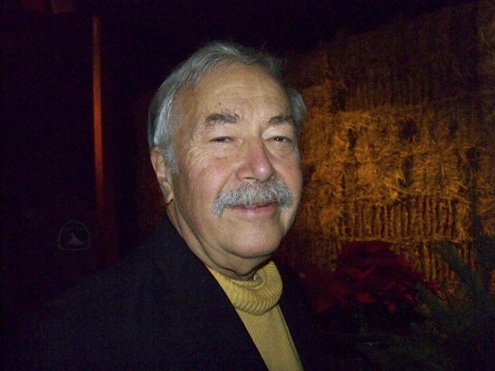 Also on hand at Toby’s was West Marin Citizen publisher Joel Hack. The once disheveled journalist is looking dapper these days now that West Marin’s newspaper “war” seems to be coming to an end. Joel has hired as a part-time reporter my friend Lynn Axelrod, who once worked for me at The Light. 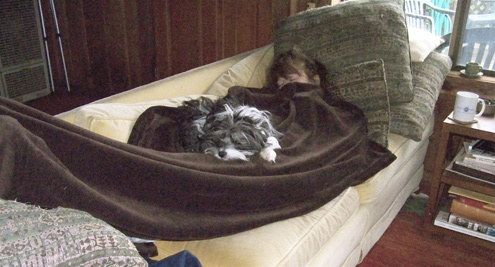 Earlier in the day when Lynn tried to use a coverup in order to take a nap, Eli, the dog of Citizen ad manager Linda Peterson, quickly tracked her down and took her into custody. Lynn, by the way, took all the above photos except this one. 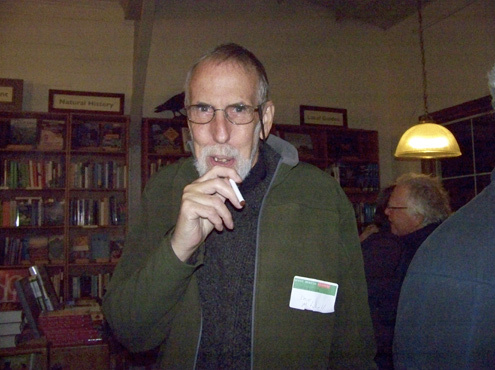 Great review of the Festival of Lights, and thanks for those nice photos of West Marin Review celebrating at the book store, where your cigarette WAS the talk of the town. I have been reading your blog and enjoying it. You write good. I like your wildlife pictures. They are so cute. I hope you have a Merry Christmas. I am a Granny age 56 in case you are wondering. GOTTA GO. got a pie in the oven. You are a totally good writer. Sparsely Sage and Timely is powered by	WordPress 4.9.10 and delivered to you in 0.627 seconds using 56 queries.